He failed to get on base as often, struck out more, and his offensive production declined overall significantly in 2018. Look at his gaudy 2017 numbers. In what other areas of his game did Hosmer change, outside of what the data above has told us? After all, his BABIP decreased from .351 in 2017 to .302 this past season. He clearly didn’t have the same luck on batted balls, which hindered his ability to produce offensively. Hosmer hit balls with a higher average launch angle in 2017 and unsurprisingly hit the ball harder with more consistency. This season, he started hitting the ball on the ground even more often, and his numbers suffered as a result. He lost almost a mile an hour on his average exit velocities, and his average launch angle ranked as the lowest among all qualified major league hitters. That’s never a good sign and is the principal reason as to why he didn’t live up to expectations with the bat last season. 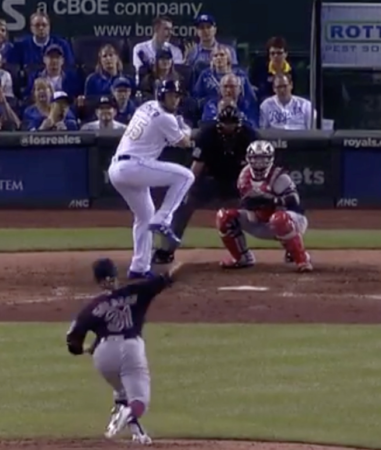 Hosmer’s front and back feet are aligned on the left, though they are not in the frame on the right. He’s in a more balanced position in the frame on the left, which was potentially a key to his success in 2017. Clearly he should consider going back to his previous hitting mechanics, which could also help him bring up his average launch angle. This is a player who has shown himself to be a talented hitter at times during his tenure with the Royals, so the Padres should encourage him to go back to what worked for him there. Maybe he’ll never be a high-launch-angle guy, and it isn’t something that works for everyone. Currently, the Padres just need the best version of Eric Hosmer they can get, and that doesn’t require him to try and hit home runs every at-bat. If he could simply increase his launch angle to five degrees, for example, it would likely work wonders for his hitting results. 2018 NL MVP Christian Yelich had an average launch angle of 4.7 degrees — an example of a player who found considerable success with a more line-drive-heavy approach. 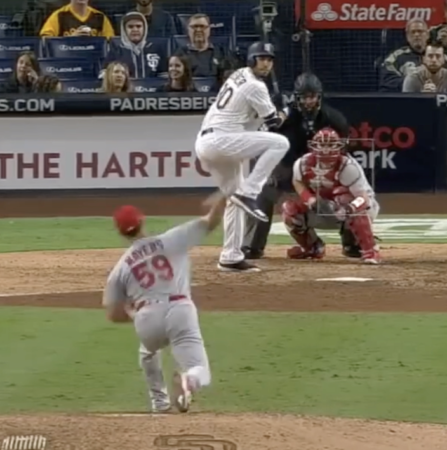 If Hosmer were to cut down on his strikeouts and hit more balls in the air, he could be a much more valuable hitter for the Padres next season. In order to be the productive player he once was, Hosmer needs to make some relatively small adjustments to his hitting profile. After all, at least going back to the hitting mechanics he used in 2017 would allow Hosmer to hopefully improve in 2019. The Padres will need him if they’re going to be competitive with this roster next season. This post was originally published here at East Village Times. All data used in this article is courtesy of Statcast. We hoped you liked reading Why Did Eric Hosmer Decline in 2018? by Conrad Parrish! Interesting stuff — Thanks for sending the link! He worked on his launch angle but kept the horizontal bat. This causes the bat to brush across and up the ball causing topspin which pulls it down and means the dreaded rolled over grounders. This means hosmer essentially can only lift balls that are waist high or higher. Interestingly apparently hosmer did work on his LA with a “guru” in the offseason but the result was the opposite. Not always easy to do it.